I’ve always believed that dates are important. I was born on October 19. I celebrated my 40th birthday on the day of the stock market crash, October 19, 1987, six weeks after I forewarned my Forecasts & Strategies subscribers to “sell all stocks and mutual funds.” It wasn’t just a lucky call; it was based on my study of the economic history of America. October 19 is also the anniversary of the end of the War for Independence, when the Americans and French won the Battle of Yorktown in 1781. April 19, 1973, is also a memorable date in my life. My wife Jo Ann and I were married on that day, and we’ve been partners ever since. April 19 turns out to be the date that the American Revolution began with the Battle of Lexington and Concord in 1775. Even though we didn’t know it at the time, my birth date and our marriage symbolize our lives together. — 1493: Uncovering the New World Columbus Created, by Charles C. Mann. — 1776 by David McCullough, a history of that annus miraculus that focuses on George Washington and the American Revolution. In a broader sense, it is the culmination of the Enlightenment. — 1968, The Year That Rocked the World, by Mark Kurlansky, which tells the story of the Vietnam protests and the assassinations of Bobby Kennedy and Martin Luther King Jr. 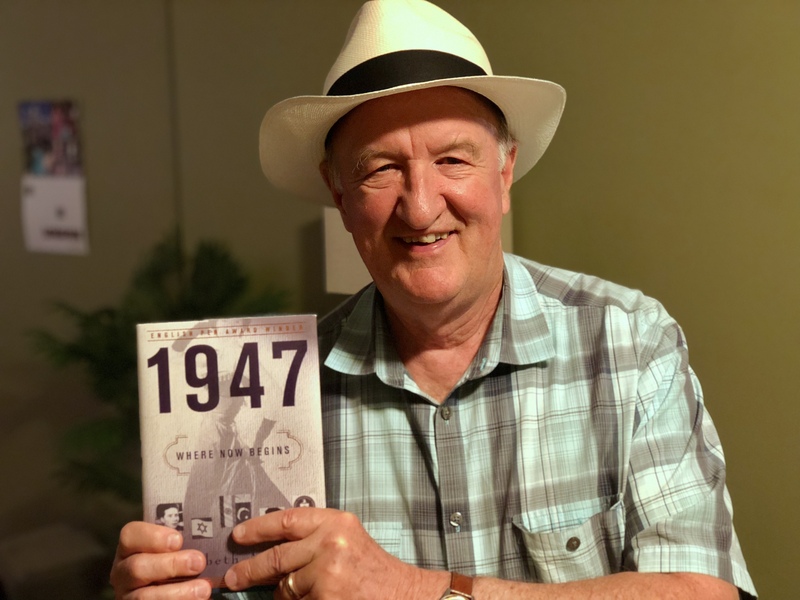 So, I was happy to see that a book has been published highlighting the events that took place the year of my birth, 1947. And the subtitle is pretty clever: 1947: Where Now Begins, by the Swedish writer Elisabeth Asbrink. Of course, the suggestion that the modern world began in 1947 is an overreach. One could say the same for 1946. In fact, a book is so identified: 1946, The Making of the Modern World. — The Voice of America started transmitting radio broadcasts to Eastern Europe and the Soviet Union. — The first Tony Awards were announced. — Jackie Robinson became the first African American to play Major League Baseball. — UFO sightings became all the rage, especially in Roswell, New Mexico. — The Taft-Hartley Act became law. — Chuck Yeager broke the sound barrier. — The House Un-American Activities Committee investigated the Hollywood Ten as communist sympathizers, who were subsequently blacklisted in Hollywood. — “Meet the Press” debuted on television. — First Dead Sea Scrolls discovered in Judean Desert. –The CIA was created (I worked for the Company in 1972-75). — The Mont Pelerin Society was founded in Mont Pelerin, Switzerland, by Austrian economist Friedrich Hayek. I’ve been a member since 2002 and a lifelong student of Austrian economics. — On July 24, the Mormons celebrated their 100th anniversary of Pioneer Day (arriving in the Great Salt Lake). And, of course, on Sunday, October 19, 1947, I was born. Both Steve Forbes and Larry Kudlow were born in 1947 as well. Other famous people born that year include Hillary Clinton, Arnold Schwarzenegger, Stephen King, Elton John, O.J. Simpson, and Kareem Abdul-Jabbar. Mark Skousen is the editor-in-chief of “Forecasts & Strategies,” a financial publication now in its 38th year. He is the founder and producer of FreedomFest, “the world’s largest gathering of free minds,” which meets in Las Vegas every July. For information go to https://www.freedomfest.com/ or call 1-855-850-3733 ext 202. Last week, the entire high-tech sector fell out of bed after new reports revealed that private companies were selling– and politicians were buying– the personal information of 50 million Facebook users, prompting government regulation of social media. However, the Facebook scandal is just the tip of the iceberg. Apple’s iPhone and Samsung’s Galaxy know your every move, even when your cellphone is turned off. And now Amazon and Google have carried invasion to its zenith with the acquisitions of companies making smart doorbells, thermostats and other home security devices. As one analyst put it, “Now they can see your door and hear what’s going on in your house. They can tailor marketing to your consumption patterns. They can fine-tune delivery to catch you when you’re home. In theory they can even let themselves in.” Scary! CNBC’s Rick Santelli, father of the Tea Party movement, told me this is a “biggie” and could derail the tech and social media industry for some time as government intervenes to start regulating Amazon, Facebook, Apple and other tech companies. Investors, beware! Action to take: “Big Brother Surveillance Panel” has just been added to our “Emergency Summit” at FreedomFest. We will have a special session with top security and privacy experts: “CAN YOU KEEP A SECRET? How Business, Government and Even Your Doctor are Monitoring You and Mining Your Data, and How You Can Once Again be a PRIVATE Citizen.” Join us at www.freedomfest.com. Normally, we record all sessions at FreedomFest, but upon request of many of our speakers, we will turn off the tape recording so they can speak freely. You must be there in person to hear it all. Why meet at FreedomFest? Steve Forbes says it best: “FreedomFest is where the best ideas and strategies are fleshed out.” That’s exactly what we plan to do at this special meeting — determine the best strategies to protect ourselves from the unfolding privacy crisis. Mark Skousen is the founder and producer of FreedomFest and the editor-in-chief of Mark Skousen’s “Forecasts & Strategies,” now in its 38th year. He is a Presidential Fellow in economics at Chapman University. Go to www.freedomfest.com, or call toll-free 1-855-850-3733, ext. 202 to register. Special Alert! We are suddenly headed down a dangerous road that could spell disaster for our country and your investments. The turning point came almost overnight. Based on my sources in Washington, the Trump administration is determined to engage in a confrontation with China and other trading nations that could undermine the whole global free-market economy, with grave political implications. Instead, it may ignite a “chain reaction” and a global trade war where everyone loses, including the United States. Higher prices, another recession, even war could be on the horizon…. I was told that Trump is still being unduly influenced by Peter Navarro, author of “Death by China,” and the most dangerous anti-trade protectionist in the White House since the Hoover days. On top of that, yesterday Trump named John Bolton, a hawk who is known for taking a hard line against Russia and advocating military force against North Korea and Iran, as his national security advisor. This could mean war sometime in the near future. In short, we are witnessing the dark side of the imperial Trump. No wonder the DOW tanked 700 points yesterday, signaling what could be the end of the bull market on Wall Street. The first year of the Trump Administration had mostly positive results, with much needed tax and regulatory relief for American businesses and workers. The stock market soared on the policy changes. But 2018, an election year, is turning out to be an entirely different matter under this mercurial president. President Trump is now reversing course and stubbornly refusing to back down. It’s not only the prospect of a major trade war that has investors and citizens running scared. It’s his new Fed chairman, Jerome Powell, who is aggressively raising interest rates. Mortgage rates are now approaching 5%, the highest in years, threatening to cut off a growing real estate market. At the same time, Trump and the Republican leaders on Capitol Hill are pushing through a gigantic $1.3 trillion federal budget that is bankrupting the nation. In a period that economists regard as full employment, we should be running a surplus. Instead, the deficit is expected to exceed $1 trillion next year, ballooning our national debt to $22 trillion or more. With interest rates rising fast, this spells doom for our economic sanity. In short, the Trump White House is in chaos, as reflected in the numerous firings and resignations – more than any other administration in recent history. For these reasons, we have decided to hold an emergency “Global Economic Summit” at FreedomFest, July 11-14, at the Paris Convention Space, Paris Resort. All FreedomFest attendees will be invited to attend this special private meeting. Normally we record all sessions at FreedomFest, but upon request of many of our speakers, we will turn off the tape recording so they can speak freely. You must be there in person to hear it all. Steve Moore, chief economist at the Heritage Foundation, and a Trump insider who worked closely with Larry Kudlow, the new economic czar, to push through the Tax Cut and Job Act of 2017. Can Kudlow make a difference and keep Trump from blundering further? Moore has the answers. Grover Norquist, president of the Americans for Tax Reform, whom CNN calls “the most powerful man in Washington.” Grover was instrumental in passing the tax cut.What are he and ATR doing to reverse the tide of big government? Grover will hold his famous by-invitation-only “Wednesday Meeting” on July 11 to give us an update on how we can be instrumental in winning this important fight. George Will, political analyst for MSNBC, and former analyst for ABC and Fox News; Ross Douthat, conservative columnist for the New York Times; and Larry Elder, libertarian talk show host, will unmask the media’s powerful role in the growing crisis. Steve Forbes and John Mackey, co-ambassadors of FreedomFest, will assess the trade war’s effect on business in North America, Asia, Europe, and other nations, along with former Carl’s Jr CEO Andy Puzder. Rich Lowry, editor-in-chief of National Review, and political columnists John Fund and Deneen Borelli will assess the impact of the Trump agenda on the 2018 elections. Judge Andrew Napolitano, Fox News legal analyst, will cover the growing legal debates inside the White House: Will they derail the Trump agenda? Roberto Salinas, president of the Mexican Business Forum, on the anti-Trump backlash in Latin America that is fomenting political and military unrest south of the border; and Barbara Kolm, president of the Austrian Economics Center, will report on the European reaction to Trump’s trade war and the “America First” policy. Jim Rogers, Doug Casey, Keith Fitz-Gerald, Peter Schiff, Robert Kiyosaki, Alex Green, and a host of other financial experts will prepare you for the impact of the new Trump and Federal Reserve policies on your investments. FreedomFest is the only liberty conference with a full three-day investment seminar inside it. Why? Because financial freedom is essential to personal freedom. We want you to have both. Why FreedomFest? Steve Forbes says it best: “FreedomFest is where the best ideas and strategies are fleshed out.” That’s exactly what we plan to do at this special meeting – determine the best strategies to protect ourselves and our money from the unfolding Trump crisis.